Many growers have recently called about the bark being stripped from their trees. 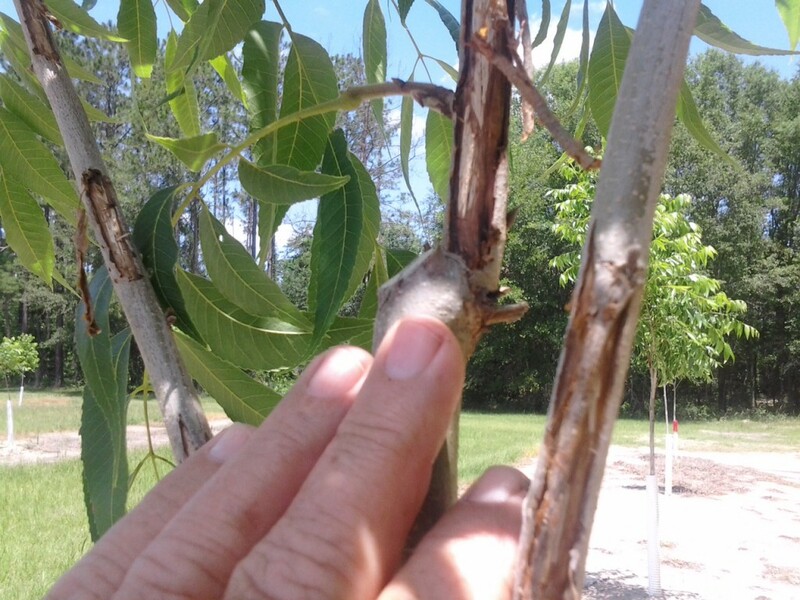 This normally occurs on smooth-barked limbs or central leaders 3″ or less in diameter. The culprits here are flying squirrels. When food sources become scarce, flying squirrels will strip the bark off smooth barked branches to feed on the tree’s cambium. If they completely girdle the limb or central leader at any point on the tree, the limb or leader will die from that point upward. If the damage does not completely girdle the limb or tree, the wound normally heals over with time. Flying squirrels are nocturnal. 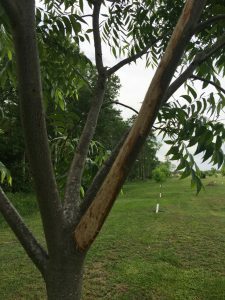 Their home range is usually no more than an acre so damage tends to be isolated to certain spots in the orchard. This is an easier problem to deal with in a yard rather than an orchard situation. In yard situations, alternative feeding is the easiest way to prevent squirrels from stripping tree bark. Scatter shelled or cobb field corn on the ground near the trees, or place it on a shallow feeding platform. A variety of traps will catch squirrels, including No. 0 or No. 1 leghold traps, the “Better Squirrel and Rat Trap,” box traps, and cage traps. Regular rat-sized snap traps will catch flying squirrels and small pine squirrels. Glue traps for rats will catch small squirrels. Since squirrels are classified as game species in most states, trapping permits may be required from your local state wildlife agency or municipal Animal Control office. Wire cage traps and box traps can be used to capture squirrels alive. Tie trap doors open for 2 to 3 days to get squirrels accustomed to feeding in the traps. Then set the traps and check them twice daily. Inform your neighbors of your trapping activities. Translocation of tree squirrels is a questionable practice because of the stress placed on transported and resident squirrels and concerns regarding the transmission of diseases. Good baits are slices of orange and apple, and peanut butter. Other foods familiar to the squirrel may also work well, such as corn or sunflower seeds.